Mikraot Gedolot, Torah, Neviim and Ketuvim, with the commentaries and Masorah. Basel: Ludwig König, [1618-1619]. The entire Bible in one thick volume, with a fine leather binding. Five books of the Torah, with Targum Onkelos, the commentaries of Rashi, Ibn Ezra, Baal HaTurim and Masorah. Neviim Rishonim, with Targum, the commentaries of Rashi, Radak, Ralbag, R. Yeshaya and Masorah. Neviim Acharonim, with Targum, the commentaries of Rashi, Radak, Ibn Ezra and Masorah. Ketuvim, with Targum, the commentaries of Rashi, Ibn Ezra, Ralbag and Rasag. 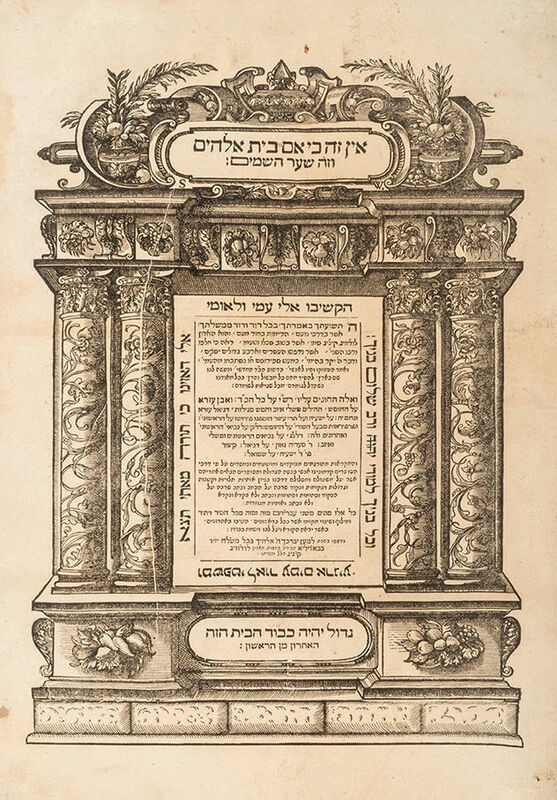 At the end of the volume are the Targum Yerushalmi on the Torah, the long Masorah on the Bible in alphabetical order and "Tiberias" – an introduction and lengthy composition on the history of the Torah transmission, by Johannes Buxtorf (in Latin). This is the second edition of this composition, edited by his son J. Buxtorf II, printed in Basel, 1665. Large, impressive volume. , 228; , 234-441; , 442-705; 707-837, 839-881, 883-946; 7, ; 67 leaves. , 108 pages. Without the 36 leaves of Haftarot according to various rites, and  leaves of errata, which are found in a few copies. This copy does not contain the blank leaves 838 and 882, and the blank leaves which sometimes appear after leaves 441 and 705 in the first pagination, and after leaf 67 of the last pagination. 41.5 cm. Thick, light-colored, high-quality paper. Good condition. A few stains. Minor damage. Light-colored leather binding, with minor damage. This is one of the prominent Bible editions. Its significance is owing in part to the facts that it contains the complete long Masorah and short Masorah, and that the text of the Masorah was corrected from copiers' mistakes. It is one of the most important editions for researching the Masorah.